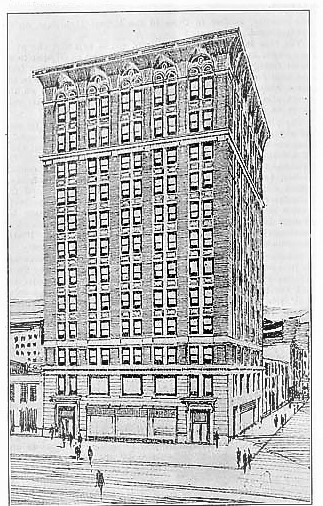 In 1910 the rather oddly-named The Second Manhattan Office Building Company headed by George C. Beach commissioned the architectural firm of Squires & Wynkoop to design a modern loft building at the northeast corner of Seventh Avenue and 24th Street. The partnership of Frederick Squires and John Wynkoop was only four years old; but the pair were already well known for their creative use of tile and terra cotta--promoted as being fireproof. The developers were less than more creative in naming their proposed structure. Initial records called it the "7th Avenue and 24th Street Building." Although Wynkoop had graduated from the distinguished Ecole des Beaux Arts only a few years earlier; the design of the new building would be decidedly Italian. The three-story granite and limestone base could have belonged to a 15th century Italian palazzo. But it was the stunning terra cotta cornice that would wow architectural critics. The cost of construction was project at about $320,000, just over $8.5 million today. 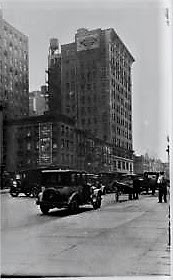 The Real Estate Record & Builders' Guide said the building was "Illustrative of the beginning of the transformation of Seventh avenue." 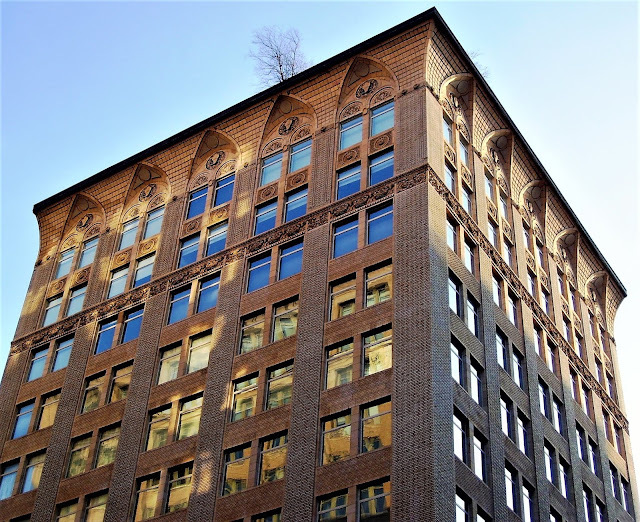 Nine stories of gray brick were interrupted by a terra cotta cornice at the 10th floor. The structure was completed in 1911. The New York Times' critic was impressed, saying that the developers "have not limited their designers in any way as to the exterior embellishment." He could not ignore the extraordinary cornice, calling it "of unusual design." The American Architect agreed. It captioned a photograph of the building: "Note the introduction of terra cotta in the cornice." The critics had reason to take notice. The elaborate decoration was a singular--and expensive--treatment of a utilitarian factory building. The tenant list reflected a curious blend of industries. 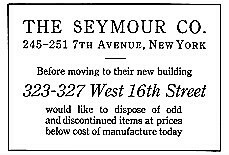 Two of the original occupants were The Economist Manufacturing Company, makers of waists (the popular women's blouse) and dresses, and Boston-based paper manufacturer The Seymour Co., which used the space as its New York warehouse. The Seymour Co. had been in business for a century, making "high-grade book, cover and writing papers." After moving in the firm included a photograph of its new building in its advertising. Also in the building was the Frederick Osann Company. The firm manufactured commercial sewing machines and acted as agents for the St. Louis-based Universal Cutter Co. That firm manufactured equipment capable of cutting delicate fabrics without damage. Wallach Bros., makers of waists and dresses, leased 7,000 square feet in December 1914, and The Nursery Furniture Company and women's wear makers D. Baron & Co. signed leases a few months later. When raincoat maker Hanauer & Rosenthal leased a floor in June 1917 The Sun commented "This completes the renting of the building." 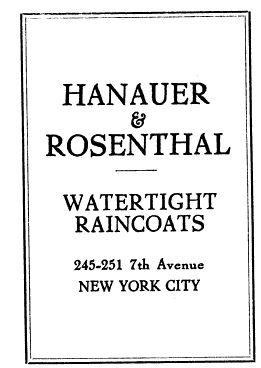 Ralph Rosenthal and William Hanauer took advantage of the war in Europe by landing lucrative Government contracts for its raincoats. But on June 23, 1918 The Sun ran a shocking headline: "16 ARRESTED IN ARMY RAINCOAT FRAUD CHARGES." Among the 16 "directing officers" charged "with bribery or conspiracy to defraud the Government" was Ralph Rosenthal. His partner would not be far behind. On August 13 the New-York Tribune reported that 19 "raincoat men" had been indicted under the new sabotage law. Both Rosenthal and Hanauer were listed. The newspaper noted that General John J. Pershing characterized the raincoats "as rotten." Rosenthal and Hanauer escape the maximum sentence of 30 years in prison and a $10,000 fine; but they faced a disastrous blow to their personal reputations and that of their garments. And so they changed course, turning to making women's coats and attempting to mend the damage. In May 1919 the American Cloak and Suit Review reported "With a perfectly appointed up-to-minute factory and showrooms at 245-251 Seventh Avenue...Hanauer & Rosenthal will show their initial line of cloth coats on May 15. They will confine themselves to misses' and women's popular priced better grade garments and will manufacture their entire product." The article ended saying "They are making preparations for a showing that will convince the buyers that they deserve a good share of the business." The building continued to attract garment firms. The Emporium Dress Company moved in in 1919 as did B. Saubiac & Sons. 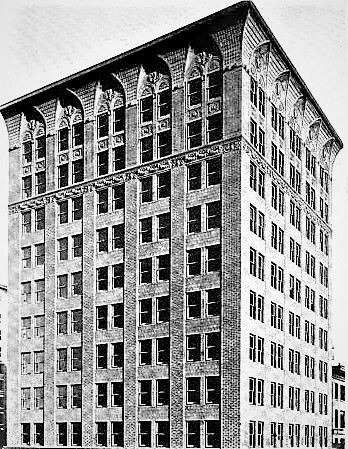 Frederick Osann was not only still leasing space, but purchased the building in January 1922. The only other original tenant, The Seymour Co. moved out the following year. The ground floor had been home to the Glaser Mercantile Credit Union for several years. 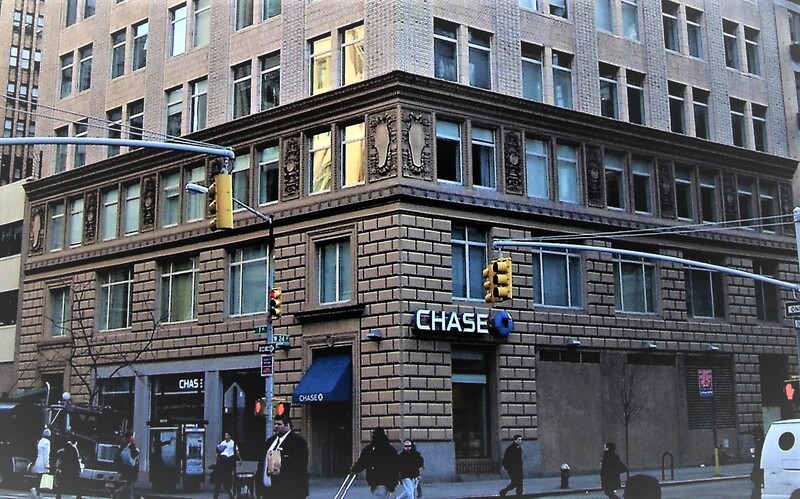 Other tenants in the building included cloak and suit maker R. & A. Rosenthal, and garment firms Jacob Greschler and Herman Grollman. As the garment district migrated north of 34th Street, a broad array of tenants began to call No. 245 home. Among them was His Lordship Products, which advertised a "Zippo lighter with sterling silver code flag initials" for the boating set in 1962. The novelty sold for about $80 in today's dollars. In the late 1970's and early '80's Medoframe, custom framing and framing supply shop was here, as was KEI Electronics Service. 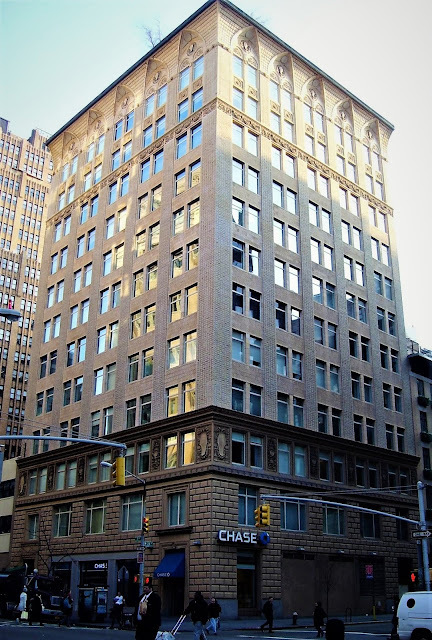 By 1986 the New York City Health Systems Agency was in the building. The Pancretan Association of America published its magazine, Krētē, here in the early 1990's. The national association was organized to "support and perpetuate Cretan culture." But all of the other tenants would have to find new space soon. In 1997 Harry MacLowe completed an ambitious renovation that resulted in 33 residential condominiums, just three per floor. It took the name The Chelsea Atelier. The renovation included a facade cleaning and restoration which removed decades of grime from the facade and resuscitated the magnificent cornice.